Ortlieb packs have mounting systems that are reliable and easy to use. In particular, the panniers can be removed from the racks simply by lifting up on the short carrying strap, yet they won't come loose or move around on rough roads. There are two lines of packs; "Basic", now called "Classic", and the more expensive and lighter "Plus", formerly "Light" line. 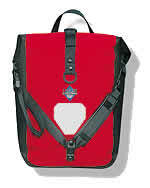 The Classic packs use a heavier, less expensive material than the Plus line. But the bigger difference is in the mounting system. The Classic QL-1 mounting system, while very secure and fast to mount and remove, requires tools to adjust for your particular rack and positioning, and has less range of adjustment. The Plus packs use the QL-2 system. Both top hooks have a wider for/aft range of adjustment, and can be moved simply by flipping a lever. The bottom hook also has more positions available and can be moved simply by loosening a knob. Given the lower weight and easier setup, I recommend the Light packs with QL-2, but I do stock some of the Classic packs with the QL-1 system. 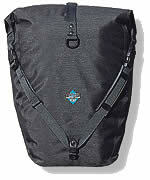 The "Roller" bags are essentially dry bags, the type used by kayakers to keep their gear dry even if submerged in water. You can position the Roller bags any way you like and water won't get inside. The "Packer" bags are also waterproof, but only if kept upright and can't be submerged. 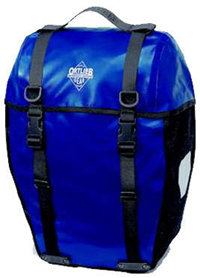 For more information about Ortlieb Packs, see the Ortlieb USA web site. Ortlieb packs are made in Germany. See the Ortlieb website in Germany. 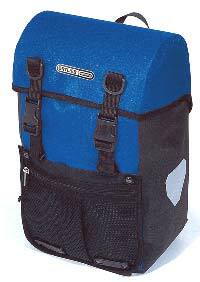 All purpose waterproof pannier for Low Rider front racks as well as rear racks. Developed as an alternative to our Front-Roller with a roll 'n' snap catch, the Mini-Biker can be loaded higher thanks to its cover flap catch, and is also ideal for children's bicycles. The Mini-Biker Light is compatible with our harness/carrying system and waterproof outer bags can be secured to the pannier. The Roller series panniers get their name from the roll top closure system. 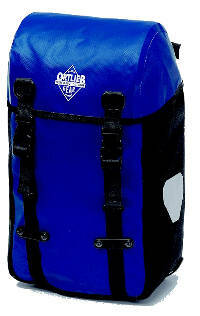 This is the systen used in dry bags for kayaking and other water sports. The pack can be completely submerged while keeping the contents dry. It takes a few seconds longer to roll up the top, but it's a small price to pay for a truly sealed bag. 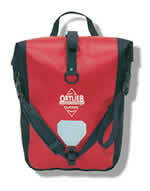 Other Ortlieb bags are waterproof when upright on your bike. The Roller bags can be tossed on the ground into a puddle and left there without your clothes getting wet. Waterproof panniers with a unique roll-top closure. 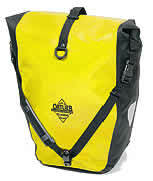 Not only ideal for use on long cycle tours, they are also suitable for everyday use as a shopping bag or shoulder bag. Width - 16" - 9"
Same as Light but with heavier, less expensive fabric and simpler QL-1 Mounting System. Smaller, waterproof pannier for Low Rider racks. Also ideal for childrens bicycles on the rear rack. The Front-Roller light with our QL 2-System has the same features as the Back-Roller Light. 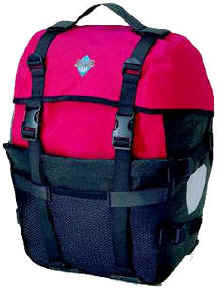 The supplied shoulder strap enables the Front-Roller to be compressed or to function as a shoulder bag. Same as Light version but heavier, less expensive fabric and simple QL-1 mounting system. 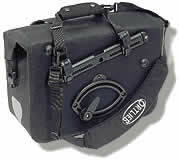 Ultimate 3 Light handlebar bag Medium size. Easy quick release attachment. Includes a terrific waterproof map case that snaps to the top. Mesh pocket in front. Includes two key rings that can snap right inside the outer mesh pocket. Comes with shoulder strap. Ultimate 3 Light handlebar bag Large size. Easy quick release attachment. Includes a terrific waterproof map case that snaps to the top. Mesh pocket in front. Includes two key rings that can snap right inside the outer mesh pocket. Comes with shoulder strap. 2" deeper front to back than Medium. Waterproof saddle bag in three sizes with roller closure for all-around use on your mountain bike, touring bike or racing bike. Mounted securely under the saddle rails and fixed to the seat post, size L offers enough space for food as well as gear and accessories you shouldnt be without on a day tour. It almost entirely replaces a small Daypack. Size M is suited for the shorter trips where you only need a rain jacket, spare tube, pocket tool and some energy bars. Size S is particularly popular among "weight-conscious" and competitive cyclists. With a capacity of 0.8 litres, however, it still offers enough space for a thin rain jacket, tool kit, spare tube and credit card. Mounting: Fitted under the saddle, the mounting makes the saddle-bag easy to attach or remove. A bracket is first clamped to the saddle rails. Then, simply slide the pack onto the bracket, click in and fasten the Velcro strip to the seat post for stability. After the bracket is secured to the saddle rails, the pack can be installed or removed in seconds. Works with most saddles but not with Brooks leather saddles! The Ortlieb clamp isn't wide enough for the rear rails. Large 9" x 6" x 4"
Medium 6" x 5" x 4"
Small 4" x 4" x 3"
The Office Bag is a briefcase featuring the ORTLIEB QLR2 system for mounting on a bike rack, padded handle and shoulder strap. Studded feet to prevent direct ground contact. Two sub-divided inner pockets with removable compartments and two folio compartments. 16"x4"x12" 794cu. in. Padded insert available for notebook computer. The Large Office Bag is a briefcase featuring the ORTLIEB QLR2 system for mounting on a bike rack, padded handle and shoulder strap. Studded feet to prevent direct ground contact. Two sub-divided inner pockets with removable compartments and two folio compartments. 16"x7"x12" 1280 cu. in. Padded camera insert for Ultimate handlebar bag. Mount your Ortlieb Panniers on a Tubus Rack. For other packs, see my Carradice page. Also, the Arkel page (coming soon).